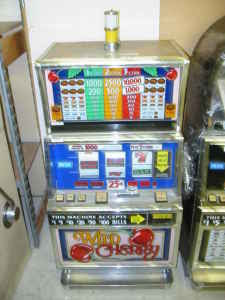 theAd>> IGT Wild Cherry slot machine. Fun for the whole family. Would make a great gift for Christmas. Takes 3 quarters and pays on one line. More models available. "Fun for the whole family." Look kids! Santa brought us GAMBLING!